To be historically correct, Shore Acres was located at 1981 Sandwich St. West (now Riverside Drive) between Bridge and Rankin. It had the same address as the present-day Ernest Atkinson Park (where the swimming pool is located). I know you like a neat and clean ship. Thank you Bill Marentette for putting the pieces together! I was totally confused about the location of the Shore Acres where my Dad played trumpet. This enclosed clipping from the late 1920s had described it as Mile West of the Windsor Ferry In Sandwich, Ontario. We tried to guess where it once stood but never figured it out. We assumed it was closere to the river. Now, finally, I have that answer. My Dad, Fred Crowly (1902-1999), and these other five buddies of his bachelor days, played music all around Essex and Kent County. His friend (Chef) Angelo Russo, another of six named performers, was well known in the area for his excellent Italian cooking as well as his musical talents. They were very proud of their musical abilities. They were booked at this top-notched hotel. Now I can see what a beautiful place it was. Getting this news in the February issue of your paper makes my day. How my dad loved to tell stories of those early jobs in Windsor. I never miss an issue of your paper. Keep up the good work and keep the Letters section growing. It is so informative. Ed: Glad to know that we had a part in solving your family mystery. I found the article on the Walkerville Substation very interesting. [Issue 21, Feb. 2002] (No, I don't want to buy it, although it might make a good location for the Science Centre.) Right at the end of the story it says that Walkerville was supplied with 60 Hz (cycles per second) alternating current before 1914. Now most or all of Ontario was supplied with 25 Hz power until the 1950s, when the whole province was converted to the North American standard of 60 Hz. If Walkerville was on 60 Hz earlier, it must have been converted twice. My own outstanding memories of the 25 Hz era were modifying low priced American TV sets that were imported by Windsor residents who then found that they would not work on 25 Hz. Since the required 25 Hz transformers were much larger, and often would not fit inside the set, the result was usually a large external power supply, setting on the floor and connected by means of a long cable. Ed: According to the J. Clark Keith article from 1957 used in preparing the Substation story, the Walkerville substation provided 60-cycle light and power prior to 1914. Then again, Walkerville was always ahead of its time. I grew up on Chilver Road and went to Walkerville Collegiate as did my father. We both had many of the same teachers, including Mr. Swanson. My aunt trained as a nurse at Grace Hospital. I am also a genealogist and so find many of the background stories of interest. It was quite a surprise to receive a few back issues of the Walkerville Times from a friend. I was surprised to see my class picture of 1927 sent in by Walter Jackson. I have that picture in a frame. I went to King Edward School then on to Walkerville Technical School [later Lowe Tech] which was quite a walk as I was born at 7 Sandwich St. E. (now 1569 Riverside Dr). I remember being in Miss Scarletts choir singing Land of Hope and Glory, sometimes conducted by Mr. Baird. My husband Ralph was born in Windsor and went to Assumption Street school and then Patterson. We were married 62 years ago in Chalmers United Church [on Windermere  now a private residence] . Rev. MacIntosh was the minister. In 1935, when I was ten years old, my mother made me join the boys choir at St. Marys Anglican Church in Walkerville. At that time I thought I had done something wrong and was being punished for it. But I eventually realized that she knew something about me that I didnt. It is a talent common to most mothers. At that time the St. Marys Boys Choir was one of the finest in Western Ontario. It was directed by Mr. Edward Greenhalf, a really fine old gentleman who kept us in line with verbal discipline and lots of practice. It didnt take long for me to find out that under the white surplice, the starched Eton collars and black silk ties, were just ordinary boys who happened to be able to sing. In those days I lived on Hall Ave., south of Ottawa Street, and on Sunday mornings I could be seen pedalling my bike up Lincoln Road, in all kinds of weather, with my surplice pinned to a coat hanger, streaming out behind me. In 1937, the choir got a new director and organist, Mr. Syd Tarleton. His two sons, Terry and Syd, were in the choir. Terry and another boy, Nick Jordan, were the prime soloists. Not only were they good, but to muster up the courage to sing alone in front of a large congregation at that young age was not for me. In those days we got paid a monthly stipend that could reach $2.50. I had inherited a paper route from my older brother, delivering the Detroit Free Press six mornings a week to 30 customers. The 90 cents a week from papers plus $2.50 from the choir made me one of the wealthier boys in the neighbourhood. Christmas was a very special occasion at St. Marys. The Boys Choir would go to Willistead Manor and sing carols. We would stand on the big stairway and the audience sat in the foyer. There was always a fire in the large fireplace, and with a multitude of decorations you couldnt help but get into the spirit of the season. Another memory was a lawn party  there were tents set up on the church lawn. I recall most clearly a game set up like that old English song Rollabowl-a-ball a penny a pitch. Later the choir would sing The Bells of St. Marys, naturally. St. Marys is a unique church. It is as if some giant hand went to a small corner of England and scooped up the local church, complete with grounds and graveyard. To those people who admire the outside, you should try to see the inside. The woodcarvings are magnificent, and with the sun streaming through the stained glass windows, it is a sight you will long remember. Finally, to those of you who have heard the sounds of a well-trained boys choir, store that occasion in your personal memory bank, for when you depart this earthly abode and enter into heaven, you will hear the angels singing, and they will sound just like the boys choir. I read an article that you wrote about the Chilver Family in the Walkerville Times. I wonder if you could clarify some of the information. When you state that some of its roots stretch all the way to Plymouth Rock in 1620 when a ancestor of the wife of its namesake, Charles Lewis Chilver, crossed the Atlantic..., what is the name of the adventurous family that eventually settled in Philadelphia? I am researching John Casper Fulmer who I think was connected to the Chilver family. I have not been able to find any information on the Fulmers in Pennsylvania. There is mention, Im not sure of the title, in The Encyclopedia of Canada, stating that John Casper Fulmers ancestry came across on the Mayflower. This article in your newspaper could probably be a clue. I appreciate your time in giving me any more information or resources that I might research. Ed., From our research, we know that the Fulmer family came to Plymouth on the Mayflower and was either Dutch or German. A descendant, Almina Fulmer, daughter of Captain Francis Casper Fulmer, (whose grandfather was John Casper Fulmer) married Charles Chilver. Mrs. Featherstone. Her two grandsons lived with her: Milton and Billy. In my mind, I can still hear Billy calling out to his Grandma, Can I have a piece of pie? She made great pies. Billy was a bit on the pudgy side as a result. The boys loved to tease me and were often my playmates during those years. Above sticker was found in the Cunningham Sheet Metal Ltd. office at 1478 Kildare. These stickers and other protest paraphernalia were created in reaction to the City of Windsors efforts to amalgamate the town of Walkerville. 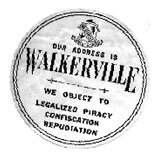 Despite the towns protests and a No vote to this take over, Walkerville was amalgamated with Windsor in 1935. One day, they dared me to lift a huge watermelon that had been laying on the shed floor. I promptly dropped it and it smashed into a million pieces. I ran home and waited for Grandma to come home and discover the mess. Nothing came of it, however, as I recall. My parents probably replaced the watermelon. Ice skating was a favourite thing to do after school. Parents would flood their yards for us to skate on. Even the U.S. Consul in Windsor at the time, was one of the parents who did this. We spent many hours skating on the rink he prepared for us in the backyard of his home. Im still in touch with his daughter Martha Vance Baker, who lives in Oakland, California. Mrs. Vance (her mother) was also good to Marthas group of friends, which included me. She was the most glamorous mother I knew, wearing long velvet gowns at the end of the day. She was a very beautiful woman. My friend Wilma Prediham Peercelly and I would often skate on a Saturday afternoon at the Windsor Arena. For a quarter in those days of the Depression, we could get into the arena, skate all afternoon and buy a hotdog. I finally got the white figure skates for Christmas that I had begged my parents for. The uniforms for teenage girls in those days included a suede jacket, a tartan skirt, knit socks and saddle shoes. My mothers friends would chastise her for allowing me to have bare knees in the winter. This annoyed me to no end. Coming home after school and skating made me cold but happy. Those were fun times, growing up in Walkerville during the thirties. Click here to go back to the Letters main page.